2-way traffic back along CPG Ave.
After failing to ease traffic jam around the commercial district of Tagbilaran, the City Traffic Management Office (CTMO) decided to lift the experiment on the one-way loop system but sparing some thoroughfares from the changes. As complaints from motorists continued to mount, the CTMO finally heeded to suggestions that the portion of CPG Avenue from Plaza Rizal to the intersection at Borja St. be made into a two-way street again. Its opposite side in the previous loop system, Gallares St., will remain a one-way street. The usual one-way flow along M. Parras St., M. Torralba St., and Lessage Street will remain. However, the direction of the flow will be reversed along Gallares St. This means vehicles will enter from the Cathedral point of J.S. Torralba St. going to Borja St. and up to the pier area. All vehicles heading the causeway or those bound for Dauis or Panglao may turn to the side of the Cathedral or along Garden Café at J.S. Torralba St. instead of proceeding to Lessage St. to turn right. The changes took effect May 7. 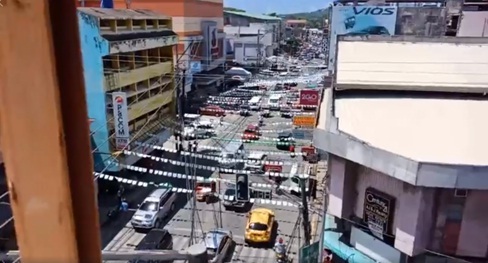 The current implementation of the one-way loop system around the business area of the city, which is now on its last day, is the second attempt of the CTMO to solve the traffic woes in the area. It only lasted for four months and one week since its implementation on December 28. CTMO Head Tony Samante’s predecessor, Amit Miro, also experimented on the one-way loop system but also gained criticisms. Samante started the current one-way loop system experiment with a few changes from Miro’s version. It’s one-way from the intersection at J.S. Torralba St. or the point from Plaza Rizal going to the intersection at Visarra St., turning left to Gallares St. and the opposite direction in the loop is from the corner at Visarra St. and Gallares St., going to the intersection at J.S. Torralba St. at the side of the Cathedral or the Garden Café entrance, and completing the loop at the rotunda around Plaza Rizal in front of the Cathedral. Samante was quick to add the loop in the loop system where vehicles going to Dauis or Panglao have to turn left to Lessage St. and not to J.S. Torralba St. point of the rotunda, making one short block from the rotunda to the corner at Gallares St. by the side of the Cathedral a one-way portion of the street. Last month, Samante surprised the motorists with the extension of the one-way stretch of the CPG Avenue up to Borja St. and those going to the pier area and K of C area cannot turn left at Visarra St. then turn left to the old campus of Holy Spirit School or the corner at Gallares St., but make it at the corner of Borja St. to Gallares St.
Also, vehicles from Borja St. could then no longer turn left to CPG Avenue or cross to the other side of Borja St. along the old HSS campus which has been made one-way road. During the time of Miro, the City Council proposed to implement the one-way loop system that had been experimented to solve the traffic jam along the commercial district of the city. However, it hit snag as mounting criticisms from the motorists grew. Under Samante, the CTMO, on its first week of implementation then, claimed the one-way loop system generated positive remarks despite complaints of inconvenience from motorists and pedestrians. Finally, the CTMO gave in to the public clamor to return the two-way traffic rule along CPG Avenue because the one-way loop system only worsened the situation since motorists who do not intend to pass by the area will be forced to do so just to reach their destination.